Abstract games, as a genre, trade on the idea that they are easy to learn and difficult to master. 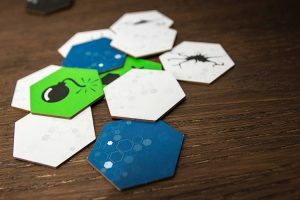 While that is maybe truer in theory than practice, today we are looking at a game called Hexagone that is trying to create just that kind of experience. Hexagone is a true abstract game—there isn’t any shout of a theme here. But players will race to complete patterns with a simple tile-laying mechanism. Hexagone plays 2-4 players in 30-45 minutes. Add a new pattern card to the display. If there are already three available, the one that has been available the longest is removed. Play any number of tiles from your hand and claim structure cards if the matching pattern exists. Draw three new hexagon tiles from the bag. Pattern cards show the layout you must try to complete. The hexagon tiles come in four varieties. The structures you are trying to build normally require some mix of blue and white hexagons in a particular pattern. Most of the available tiles are white as the blue ones are most rare. There are also green hexagons that don’t get added to the structure but instead represent one-time use powers that give the player a special ability. Many of the white tiles are also “cracked.” For the most part, when a card is claimed, whatever tiles are used to score that pattern remain in the structure. The cracked tiles, however, are removed when they are used as part of any pattern. On your turn you can play any number of tiles and claim any patterns you are able to make. It is possible to claim multiple in a single turn, but if you are using any of the cracked tiles as part of the structure, they will only be able to score a single time. The pattern cards have a difficulty range on them, allowing you to make the game difficulty scale based on the players you are playing with. The game ends when all tiles have been drawn from the bag. Players score points based on the pattern cards they’ve completed. The more difficult cards are worth the most points, allowing players who choose to spend multiple turns completing a single large pattern to not fall behind. All hexagon tiles are played to the center of the table. 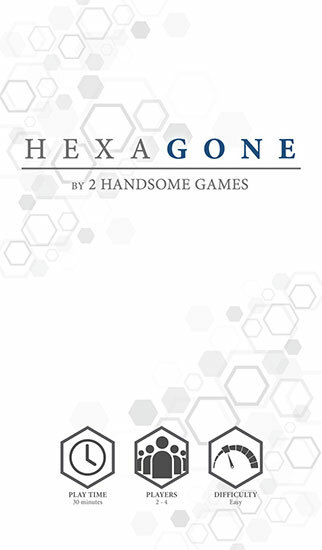 Hexagone is a fairly straightforward abstract tile-laying game. You’ll be able to teach it to other players and get everyone up and running within just a few minutes. As far as the gameplay is concerned, the real trick of the game comes in how the patterns are executed. To start, with there is a fair amount of spatial awareness required to just notice and work through how to orient the tiles to make the required patterns. The more complex pattern cards require sometimes 10 or more tiles and you must carefully trace a path to make the pattern you need. Green tiles can be used for special actions. You’ll want to keep in mind making plays to set yourself up for future turns as well. You only get to draw three hexagons at the end of your turn, and you have a maximum hand size of six at any time. So, you can’t stockpile everything and hope to just throw it all down on the table at the very end. 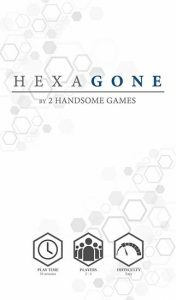 Hexagone can play out quite differently over numerous plays. In some cases, I’ve had games where there is a large structure that remains quite intact and everyone can make patterns fairly easily. At other times the cracked tiles get used more strategically to keep things from connecting quite so nicely. 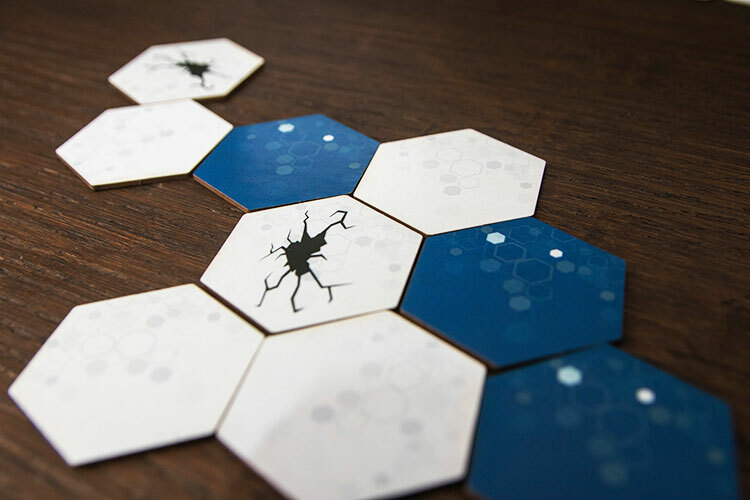 Hexagone is live on Kickstarter today, if you have interest in tile laying abstracts it’s worth taking a closer look. The ruleset is dead simple, and you can play it in about 30 minutes. 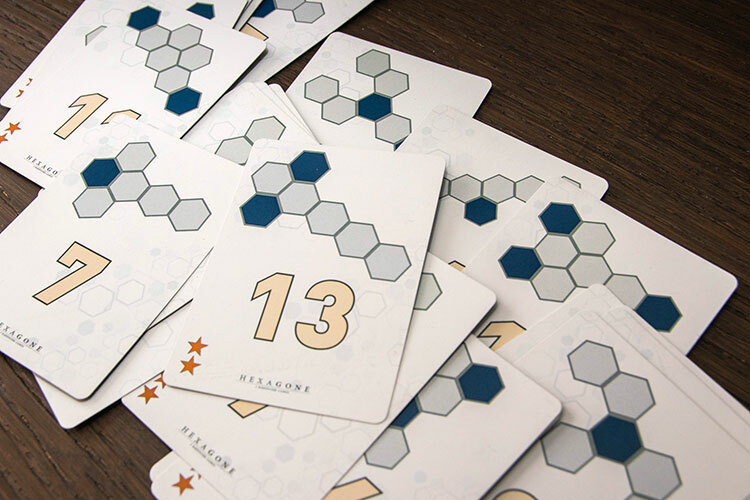 There is enough depth in Hexagone that there is more to discover with repeated plays. There are significantly more pattern cards than you’ll likely get through any single game and which patterns come out at which times can be integral to how everything plays out. Be sure to check out the campaign page for more information or to become a backer.